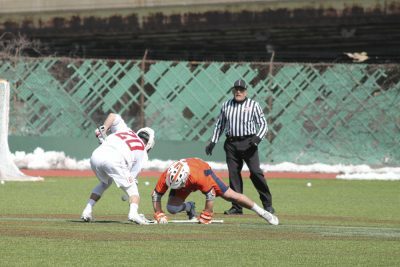 Following a 16-9 loss to Colgate University Saturday afternoon, the Boston University men’s lacrosse team will now turn its sights to Bucknell University this Saturday. The Terriers (4-3, 0-2 Patriot League) have yet to win a Patriot League matchup, but BU’s offense looks to be in good hands moving forward, thanks to the rapid improvement of freshman attack Chris Gray. While much of the opposing coach’s focus lies on holding senior attack Jack Wilson and junior attack James Burr in check, Gray has established a presence on the Terriers’ attacking line and has recorded three five-point efforts thus far. However, the numbers do not tell the full story for Gray. The freshman’s field vision, composure and decision-making ability have all stood out to Polley. While much of the Terriers’ success will hinge on offensive production and efficiency from Gray and the rest of the BU attack, Polley has stressed the importance of maintaining possession and controlling the faceoff X. The Terriers are currently winning only 39.9 percent of their faceoffs. During last Saturday’s game, Colgate (4-3, 1-2 Patriot League) dominated the faceoff X over BU, with senior faceoff specialist Collin Orr winning 15-of-17 draws in the second half. The United States Naval Academy also edged the Terriers 14-8 at the X in the Terriers’ first Patriot League matchup of the season on Feb. 24. If the team can improve on faceoffs, it will limit the amount of opportunities for its opponents to push the tempo and come away with easy goals in transition. When the Terriers fall behind late in the game, as they did against Colgate with a 10-6 deficit leading into the final quarter, Polley stressed that controlling possessions is imperative for BU to mount a comeback. Turning their attention to the Bison (4-2, 2-1 Patriot League), who will be their first competitor of three consecutive road games, the Terriers will need to prepare for a high-powered and versatile attack. Bucknell poses serious threats to the BU defense, both on the perimeter and close to the goal, with seniors midfielder Sean O’Brien and attack Will Sands. While O’Brien possesses a cannon of a shot from the outside, Sands is more of a playmaker who facilitates the offense from behind the goal and racks up assists. Sands currently leads the Bison in points (32) and assists (21). In an early season consisting of only six games so far, Sands has already recorded two eight-point efforts, which was highlighted by a two-goal, six-assist effort against Marist College in Bucknell’s season opener. “Sands is such a great player and certainly he’s going to make plays, but we can’t have him go off for a five-assist game,” Polley noted. This focus on ball movement and sharing the success is the main driving factor of the Bison’s attack, according to Polley. Polley noted the challenge Sands and the rest of Bucknell’s offense pose to his team’s defense that allowed 16 goals against Colgate. BU faced a similar threat to Sands in Colgate junior attack Sam Cleveland, who torched the Terriers for six assists. This experience will likely be in BU’s favor while preparing for the Bison, and will provide a valuable learning experience for its developing defensive squad. While BU will face another tough matchup against Harvard University on March 20 following the Bucknell matchup, Polley said that the squad’s focus is still aimed at the Bison.